I watched the meeting and thought I was in the twilight zone. Someone please explain why the Friends of the Library folks are putting forth up to 100k they raised from book sales and other private donations to fund the due diligence costs used by the city to find the best way to move the library to another location and demolish the current building. If the current library were a person it must be wondering with friends like that, who needs enemies. Who are these "Friends" and why are they spending money undoubtedly donated by people who probably wouldn't want to see their donation money used for destroying the library. I don't get it. Where were all the people who work at the library? Why do the people most intimately connected with the library not care if the property is sold to a developer? I find this a little weird. I would suspect that the employees have to be part of the get-a-long gang. Their jobs are at stake. Don't mess with the Friend$ of the Library! For years the library was a political strawman for the development crowd. The irony now is the people they used to accuse of hating the Library, the preservationist slow growth crowd, are the ones defending it. And those big development supposed Library lovers? They can't wait to get their hands on the property it sits on. Funny how things go around. Who is picking up the legal costs of the bogus traffic ticket court challenge? Water and water usage has created a real problem in our household. First off being water saving minded we put in a couple of 2 position flush toilets. These very expensive toilets were carefully used as per city instructions and we were able to save a lot. We got our water bill down way below our allotment, I mean we got down to 2 and 3 usage. Now here comes the problem. We called the plumbers to come out 4 times. We used such little water that there was not enough water to carry the waste to the street. Then when one of the over priced toilets broke on #2 flush and there were no parts for this exotic flusher we had hat it. Replaced those 2 with normal flushers and await the bill. We know were being held ransom for poor decisions of our local governments poor decisions. This problem has been piling up for far too long. Our city management has made so many mistakes with our water and the bills just keep piling up. Now we don't have our own water anymore and the yellow smelling water we are getting is eating up our pipes and wrecking havoc in the city. We have asked the city to please make the right decisions on dealing with the water but no one is taking the blame or lead on fixing this mess. Are there enough of us in the same boat to start a class action suit for poor management? You can't sue our city because of your poor judgement.Nobody told you to buy expensive"2 position flush toilets". It was your poor decision,and "havoc is not wrecking all over town" I'll bet Gem plumbing loves you though. You probably CAN sue the city for the way they came up to calculate your "conservation target." That number is an AVERAGE over a season comprised of three billings. That AVERAGE resulted from the city looking at how much water you used during the base year "season" and dividing it by the three bills. Not every one of those three baseline bills was exactly the same amount...that's why it's called an AVERAGE. So, if you multiply your seasonal billing target by three, that's how much water you are entitled to use for the billing season (summer or winter). Until you have gone through the three billings of the season, no one knows if you were under or over the amount you are entitled to use. If you were to challenge a penalty in small claims court, I'm sure the city would be required by the court to look at your use for an entire season before calculating any penalty. They used an AVERAGE over the base seasons, so you are entitled to the same AVERAGE calculation AT THE END OF THE SEASON too. Some time ago, while at a Council meeting, I heard Elaine say that if you have an allotment number and don't use that number, it will be taken from you. Talk about moving the goal post. Then your 2-3 units will be your expected number. Don't go over it or you will be fined. It's called control of the water and controlling you. Water allotments based on 2013 have always been unfair as some people were conserving before they had too and then were always way done on totals eventually allowed. Then there is the two billling periods, west side east side of town yet the weather pattern is the same on both sides and you need your summer allotment (because it is summer weather) when you are still on a winter allotment period. Patently unfair. City never wanted to address this. They need to do a water budget and treat everyone fairly. I wouldn't scold these people for trying to do the right thing with buying these double flush toilets. You see them in public spaces all the time but it is those toilets and the aging Sierra Madre plumbing that makes a perfect mess of this. On-line research points out that in many areas low flush toilets don't push enough water to keep pipes running smoothly. We made the mistake of putting in reverse osmosis water filter when the city first started sending out brown water only to read the maintenance manual too late in the process. Learned that three gallons of water is a by-product of the process that went to waste into the sewer for every gallon cleaned. We took it out, returned it to CostCo (discovered that many others were returned too) and installed a double water filter. Ideal would have been to run those 3 waste gallons to the toilets but that was a major plumbing project. We also didn't really like the taste of the water (flat, naturally occuring minerals missing). Expense to us was wasted time as we did the project ourself. It is a major expense when you have to call in a plumber. If you allow a "water audit",invite the city to inspect your home inside and out, you may qualify for more water, or maybe not, or maybe be further restricted depending on the whim of the CalPers auditor. At the same Council Meeting that I attended (previous post), Elaine stated, of course when we inspect your home, should we see an infraction of the code laws, we will have to site you. A former Planning Commissioner as well as a being a former Council Member said to me, Some day they will arrive at your home without an invitation and demand to see the interior of your home. Big BRO at your door. One of my biggest gripes is the cost of the water meter. I think mine is $76.00 for two months. I've been renting this meter for many, many years. I heard that surrounding cities meter rentals are much cheaper. Why do we have to pay so much more than neighboring cities? Friends could do better raising money at the book sales if they charged $2-3 for newish books rather than $1 or even less. Then use the money for library repairs. Friends should also prohibit out-of-town used book dealers from scooping up boxes of books for almost nothing, leaving residents with less desirable choices. Sierra Madre voters had a chance to correct failed direction this city was taking but Oh No, they were sweet talked into to going backwards and now look what you've got. The past is just a distant memory of the 'good ole days'.. The past costs a whole lot more the second time around. I think we need the Sheriff in town, gets old training these new cops all the time. With the new cops learning their trade at the expense of the city and residents is not a safe situation and expensive. Have you seen how some of the young officers drive? Parked in front of the Bank of America my wife said, LOOK AT THAT, that cop just ran over the curb on a right hand turn. People have seen them driving too slow and too fast, they need to set a good example for the tax payers to feel confident in these new employees. I've never see cop use a turn signal in this town. Sounds like it might be an anger issue. The new police were hired so that there would at least be the appearance of Sierra Madre having its own police force. 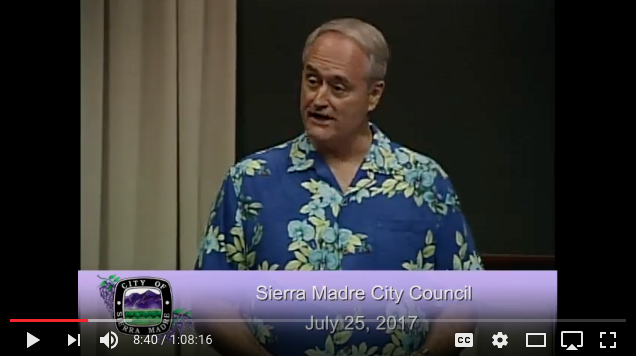 They do wear the uniforms, and drive in police vehicles that say Sierra Madre on the sides, but does Sierra Madre really have a police force? A real one? I am not so sure. Will city hall finally confess that the reason they need to bunk up the Library with the YAC is because of its CalPERS and bind debt? Will that be discussed at these as yet unscheduled meetings? If not helping with the solution then you become part of the problem. Levity and citizen involvement at the podium in council chambers addressed the problem, now the PD will correct and retrain. Rember to scheduled an August 1st, Night Out block gathering in your neighborhood so as to address concerns and get to know your officers. The Sheriffs couldn't be bothered with ticket writing, they just circled around town, watching over forgetful homeowners that leave their doors unlocked. There were no savings with CalPERS and contracts with Sheriffs. It will take a lot of retraining to turn the SMPD into an effective police force. Last year National Night Our was cancelled because it would have been overtime for our PD when the Sheriffs were our night time force. That is how poorly our PD takes the importance of safety of our citizens to heart. There goes the In-and-Out Burger truck, no free burgers. 8:57 - what if this resident didn't go to court and fight for his rights? Would there be any retraining then? Apparently no one "on board with this" save the Library building, for some time. The arguments on repairs are well over twenty years, looking for solutions. As one individual at the last meeting suggested, each and every household, renters included, write a check for $200.00 and send it in; that should cover repairs and ADA updates. 9:05am. What's your excuss for the residents of this town? Cars still left unlocked with valuables in plain sight. Check in with City Hall and meet the new Manager. The savings that have been implemented in the PD outweighs an outside group being contracted. Correct. It is important to establish that the victims of crime in Sierra Madre are responsible for crime. It helps deflect the blame from law enforcement. If you see something, call the Sheriffs. Too distracted by Judy as a surname. It must have been a difficult childhood. The water problems in this town have been years in the making. It would have been beneficial to have had new management or at least, management that was not answering to special interest groups/group in town. Incompetence from that department over years and lack of cohesiveness from Council members as to be good stewards of this towns resource; which used to be the best drinking water in all of Los Angeles. Lack of public input and involvement at City Council meetings. Checks and balances on the local level far outweigh the National level of keeping honesty and good decision-making at home. Public input and acceptance of fresh ideas open to discussion is what became lacked over years. The Water Dept's biggest problem is its millions of dollars in bond debt. Why the city refuses to come clean on this is a big mystery. Save water flush less and don't let the tp paper build up in the bowl (causing you a major plumbing head ache). So where does this tp go? In the trash can. If you are too fastidious for this approach (people with old houses and fragile plumbing have had to face this problem with this approach for years) then you will be wasting a lot of valuable drinking water to flush your toilets with each visit. The problem I have found with low flow toilets is you often have to flush them twice. Which kind of defeats the purpose. The City Hall should move to the pool area, and cut down their staff. Then the area they are in could be turned into a larger park. The library is a treasure. It is already difficult to find a parking place there. The park can increase more activities. It would also be a small town beautiful site to see when driving/walking into this lovely town. 11:48, I can't figure out if you are joking or not. The parking is terrible at the pool. It's even worse during baseball season. I went there recently on a Sunday afternoon . I had a really difficult time finding a place to park. But maybe you're just kidding! Something about this topic is really bringing them out. Infiltrate the library staff for loyalty the raze it. MAGA! Many city employees have trouble differentiating between what is good for them and what is good for the city. Often they are two very different things.